Even though Blue Man Group has been playing for quite some time in New York, we hadn't yet gotten around to taking in the show. My family and I saw them recently in Las Vegas and loved the show so much that we decided it was time to experience them in Manhattan. They did not disappoint. The theatre is much more intimate than the Vegas venue, allowing you to get up close to the Blue Men as they make their way into the audience, toss things out, etc. A teenage girl in the crowd was celebrating her birthday with a bunch of friends, and they made a point of acknowledging her presence. The audience got a kick out of it! Continuously renewing its productions to best resonate with audiences, Blue Man Group has added new material to its long-running production at New York’s Astor Place Theatre, 434 Lafayette Street. The Blue Men find themselves in a variety of new environments to discover, engage with and explore of-the-moment situations and cutting-edge technology. Much of the ontent is from the company’s larger-scale productions, adapted for use in the intimate venues. Several of the signature scenes that have made Blue Man Group such a hit remain in the production, though in most cases have also been updated. 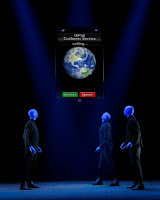 New passages include Blue Men interacting with “GiPads;” a funny and perceptive look at contemporary communication vehicles; and a pulsating new finale featuring an original Blue Man Group music score. As always, the production fuses innovative theatrical spectacle with improvisation and vaudeville-inspired comedy, art, science and irresistible original music performed by the Blue Man Group band. “The heart of our show is, and always has been, the Blue Man, and his inquisitive, wide-eyed take on the world,” said Wink. Blue Man Group is best known for its wildly popular theatrical shows and concerts that combine music, comedy and multimedia theatrics to produce a totally unique form of entertainment. The blissful party atmosphere created at the live events has become the trademark of a Blue Man Group experience. 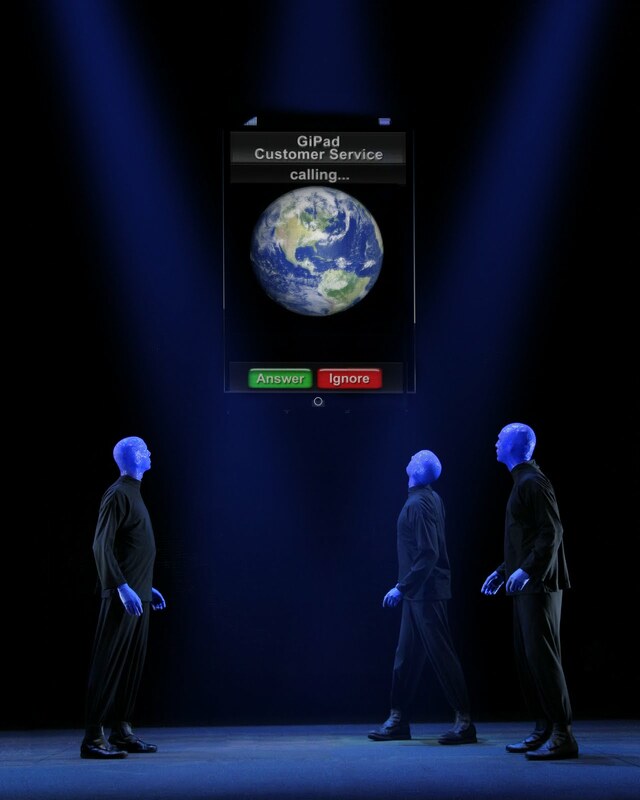 Currently, Blue Man Group theatrical shows can be seen in New York, Boston, Chicago, Las Vegas, Orlando, Berlin, Tokyo, and on tour throughout the U.S. Blue Man Group can also be seen onboard the new Norwegian Epic by Norwegian Cruise Line – the Official Cruise Line of Blue Man Group. Blue Man Group’s appeal is multi-generational, with several projects specifically designed for young people, including “Making Waves,” a popular touring exhibit for children, and the recently launched national “Invent an Instrument” competition. The company’s music, featuring custom made instruments and signature, percussive sound, can be heard on five albums, including the Grammy-nominated “Audio,” as well as various film and television projects. As the company grows, it remains true to its vision of providing exciting experiences in a variety of media, appealing to a broad range of age groups and cultural backgrounds. Learn more at http://www.blueman.com/. My son, age 8, really enjoyed the show. It's a good time for kids and adults, and they've become a "New York institution" for good reason. The interactive show is innovative, witty, engaging, clever, memorable....I could go on 'n on. Suffice it to say, Blue Man Group is a true original and worthy of being on your "must see" list in NYC. Ticket prices are $85 for main floor and mezzanine. Blue Man Group also offers $99 premium seats in the center orchestra and $95 “poncho” seats for those who want to be close to all the action. Select limited-view seats are $75. Tickets may be purchased at the Astor Place Theatre at 434 Lafayette Street or by calling (800) BLUEMAN; by calling Ticketmaster at (800) 982-2787; at all Ticketmaster ticket centers or via the Internet at http://www.ticketmaster.com/. For group of 15 or more, call Astor Place Theatre Group Sales at 212.260.8993. For more information, visit http://www.blueman.com/.